Huge thanks for your great advice & support." As well as providing shade, rain protection and protecting your carpets and furniture from damaging UV, residential awnings cut out glare. They can also help reduce energy costs in your building in the form of reducing energy used for cooling and refrigeration systems. Research shows that stopping the sun from hitting your windows is more effective in cooling than internal blinds or curtains. We supply and fit awnings with many design options. Awnings can be based on fixed frames, usually fabricated in aluminium section, or extendable systems that can be operated manually or motorised - the choice is yours. We have a large range of fabrics that are suitable for awnings depending on location and purpose. Awnings can be covered in acrylic canvas, PVC or outdoor PVC mesh. Please refer to the Sunbrella document below for advice on awning fabric cleaning. Awnings can be used in many situations as a form of protection from weather conditions or as a character look on either residential or commercial properties. 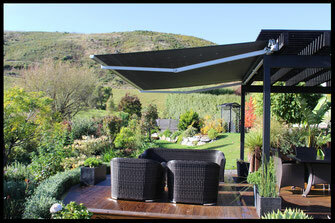 We will quote on any form of awning that you require. Awnings are ideal for blocking harsh sunlight without obstructing the view. 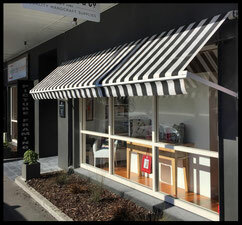 Choosing an awning is as easy as contacting us & we will provide advice on fabric, style and valance design. Whether it’s a bold accent or a neutral color that blends, the fabric used on awnings should complement the home’s interior and exterior décor. If you love bold colors, choose an awning fabric that pulls an accent color from the interior design outside or consider matching the fabric to your home’s trim color. Another option is to use a lighter or darker version of your home’s paint color or a striped fabric that features the home’s trim color on a neutral background. Retractable awnings give homeowners the maximum versatility in shading because they can open to practically any angle – even past 90-degrees, if desired – to block the sun as it traverses the sky. They even neatly retract out of sight when they aren’t needed. Extendable awnings have a clean, simple appearance because they don’t have fabric on the sides of the awning. The valance on an awning is the piece of fabric that hangs off the front bar. It provides additional shade protection, as well as an element of design, and valance shapes vary greatly from scallops and waves, to slits and arches. They can also have contrasting trim or no trim at all.